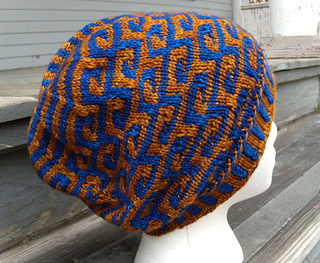 Inspired by the intense colors and designs of the paintings of Gustav Klimt this hat pattern can be purchased both individually, or as part of the Klimt Hat & Cowl eBook. 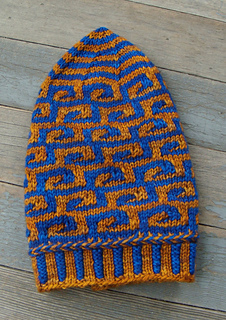 This slouchy hat uses 4 different color work techniques, all explained in the pattern - two color stranded ribbing and 2 color knitted braid used in the brim, simple stripes on the crown, and mosaic color work for the main hat body - a surprisingly easy technique where only one color is worked at a time. Pattern contains chart and written instructions. 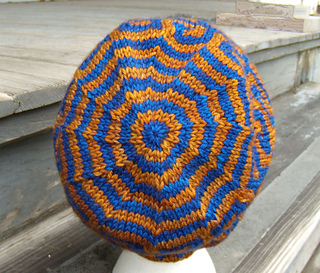 Yarn yardage listed above should be divided equally between 2 colors.